In accordance with the Federal Government’s re-authorization of the Safe Drinking Water Act of 1996, all public water utilities and companies are required to prepare and provide annual drinking water quality reports to their customers. As well as being required by Federal Law, we want to keep our customers informed about the excellent water services that we provide. Our primary goal is to provide safe, dependable, and high quality drinking water to our customers. The District has three distinct water systems serving the mostly residential areas around Lake Whatcom. The Agate Heights water system serves a small residential area near Agate Bay with water from an artesian well. The water is drawn from the well and undergoes a chlorination and filtration process at our Agate Heights Water Treatment Plant before being piped to the residences that it serves. 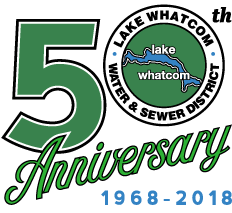 The Eagleridge water distribution system serves a small residential area on the North Shore of Lake Whatcom with water that is purchased from the City of Bellingham and piped through the District’s water distribution system to its customers. The South Shore water distribution system serves the Geneva and Sudden Valley areas with surface water that originates from Lake Whatcom. The District draws its water from Basin #3 of the lake near Sudden Valley. The water then enters our water treatment plant where it undergoes filtration and disinfection before being distributed to our customers. As with all three of our water systems, the water produced at our Sudden Valley Water Treatment Plant is of a very high quality which meets or exceeds all federal and state requirements. Publicly establish water savings goals for their customers. Implement specific water saving measures to achieve customer-based goals. Develop a Water use Efficiency planning program to support the established goals. Install meters on all customer connections by January 22, 2017. Achieve a standard of no more than 10% water loss. Report annually on progress toward achieving these goals. Click here to view Water Use Efficiency Reports for Lake Whatcom Water & Sewer District (Water System ID: 959101). For more information regarding the Water Use Efficiency Rule visit the Washington State Department of Health. View Lake Whatcom Water & Sewer’s Water Use Efficiency Plan: Appendix B – Water Use Efficiency Plan.